WHAT IS INCLUDED: One Porthole, Three filter screens of varying densities, Silicone cap, Hex key, Set of alternative thumbscrews, Recipe booklet The Porthole is a simple, beautiful infusion vessel designed by Martin Kastner of Crucial Detail design studio. 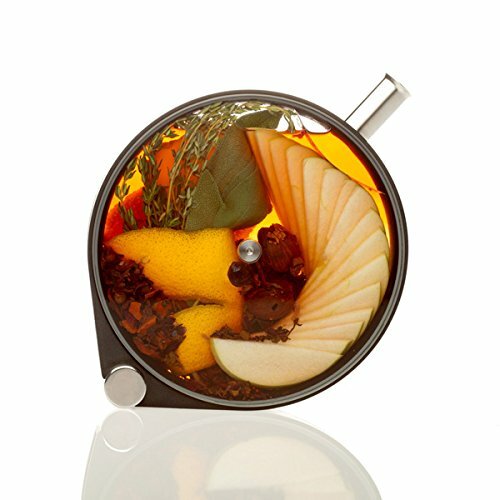 It can be used to create striking cocktails, oils, teas, dressings, lemonade, coffee, or any other type of cold infusion. Since its debut in 2011, the Porthole has gained significant attention. Originally created as a custom piece for the bar chefs at The Aviary in Chicago, IL, it has been featured in dozens of magazines and blogs, including the cover of Food Arts magazine. Early versions of the Porthole were hand-crafted in a small batch at Crucial Detail but, due to enthusiastic response to the piece, was adapted for higher volume manufacturing and launched as a Kickstarter campaign in August of 2012. The campaign sought to raise $28,500 in pledges, which it met in the first couple of hours, and ended up raising a total of $736,112 in 28 days. Dishwasher-safe, holds 13 fluid ounces - exterior dimensions: 7" x 7" 2"
If you have any questions about this product by Crucial Detail, contact us by completing and submitting the form below. If you are looking for a specif part number, please include it with your message.